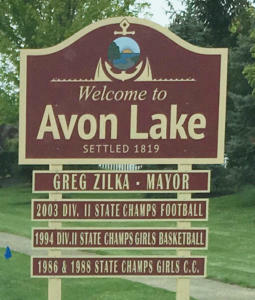 Officially a city since 1960 when it had 6,000 residents, Avon Lake, Ohio, has grown to 23,000 residents today. That explosive growth has brought a variety of residential choices for ranging from modest three-bedroom ranch houses to luxurious manors. A common thread across all these residences is consumer demand for modern bathroom facilities. According to the Bureau of Labor Statistics in its 2016 American Time Survey, personal care activities accounted for the largest daily use of time. And not surprisingly—the age group 15-19 spends almost 10 percent more time on personal care than all other age groups. That means families with teenagers would be wise to enhance an existing bathroom or add a half-bath or even an additional one. In Avon Lake, Ohio, costs for bathroom remodeling range from $2,000 to $15,000, while national ranges are from $2,500 to $24,000, according to HomeAdvisor members. Bathroom remodeling in Avon Lake translates to excellent value for your dollar. The first challenge in bathroom remodeling is to balance your dream with practicalities. Depending on the age of the existing bathroom, it may be impractical to install a curbless shower when the floor is not sufficiently high to have enough pitch so the water will drain properly. If the latest trend in floating granite top vanities is your passion, not every wall will offer adequate support or plumbing connections to make it happen. The last thing you need is a heavy counter top improperly mounted that breaks off water lines when it fails. Obviously, what is behind the floors and walls is a prime concern that can add both time and expense to bathroom remodeling. Walk-in showers are growing in popularity for largely two reasons: 1. Showering is outpacing bathing every year for its convenience and speed. 2. As the population ages, easy and safe access to a shower—without having to step in or out—is a top priority. Indeed, such access is a priority for all ages. 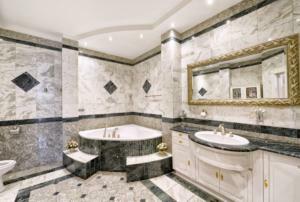 Walk-in tubs, as well, are growing in popularity for seniors and others who still like the luxury of soaking in a tub. Personal preference reigns supreme on most bathroom features. For example, ceramic or stone tile versus laminate or carpeting, a comfort height (17 to 19 inches) toilet versus standard height (15 inches), and water-saver shower heads versus other options. The City of Avon Lake building department enforces the Ohio Building Code and the Residential Code of Ohio, which follows the National Electric Code, the Ohio Mechanical Code and the Ohio Plumbing Codes. A shower can be no smaller than 30-inches square, but there is no upper limit in size. Another requirement calls for either a window or an exhaust fan. As long as code requirements are met, you have some latitude with your design for bathroom remodeling in Avon Lake. The major limitation is often where plumbing connections are located, since rerouting water lines and drain pipes can add time and expense. For instance, a tub could be removed in favor of installing a shower. Existing water and drain lines can be utilized. Mediterranean-style bathrooms often make use of geometric patterns. If you are planning a master bathroom, one option is to make a toilet room for privacy concerns, since the master bathroom may be occupied by more than one person at a time. Then when it comes to the décor, the field is wide open. Designers are showing everything from marble patterns to geometric designs to stark white. Among the more popular designs now is a Mediterranean style. These classic looks often feature mosaic tile and ornate fixtures. It gives a relaxed look to the room, resembling the casual atmosphere of the Mediterranean. Another popular bathroom remodeling idea is the well-organized stark white design. All white bathrooms are gorgeous, and exude a feeling of coolness and classic lines. 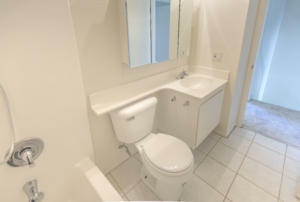 An all-white bathroom’s cleanliness in design adds to the feel of cleanliness as well. By using built-in cabinetry and shelving to store the necessary personal items, they retain a clean look. A sink backsplash with geometric patterns can add interest and depth to the bathroom design. One other style not to be overlooked is a vintage bathroom design. 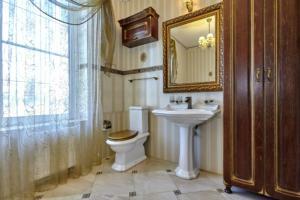 The historic charm of the 1930s and ’40s can come alive in your bathroom remodeling. Pedestal sinks, clawfoot tubs and beaded board wainscoting all add to the look. A vintage bathroom design hearkens back to an earlier age with its classic lines. Whatever your preference for design, Sciarappa Construction will work with your dream from design phase to project completion. With over 40 years of experience in construction and remodeling projects, Sciarappa Construction offers the highest level of proficiency, quality and efficiency to complete your bathroom remodeling project. Getting started on your project is just a phone call away. Contact Sciarappa Construction at (440) 930-2882 or by email at info@sciarappaconstruction.com. We’re located at 32961 Pin Oak Pkwy., Avon Lake, OH 44012. Dennis Seeds is blog editor for Sciarappa Construction. Copyright © 2016 Sciarappa Construction.